In this age when the digital industry offers you a boundless ocean of handful options, it’s just embarrassing not to have a website. Besides, with tons of ready-made website templates designed to make your life easier right from the start that’s as simple as kid’s play. When in doubt, remember no prior programming or coding skills are needed. That’s it. So, what would the advantage really be? Would they be worth both time and effort? Believe, it’s definitely worth the effort. How to check? Well, you’ll never know unless you dedicate time and effort to trying. Moreover, no matter what business you are in, this can be the turning point in your success. Sounds intriguing? Let’s learn how you can make your Real Estate website in less than 20 minutes without the headache of any coding. Sounds hard to believe? Let’s check. On top of that, enjoy a video proving that it can be done in 19 minutes using Good Homes WordPress theme. If you are an experienced Web Studio or Freelancer go ahead and skip the first two paragraphs. But read carefully the rest of the article. There are plenty of useful articles that explain how to choose a good domain name and reliable hosting provider. I will not dwell on this stage in detail. I will just underline that this is an extremely important stage. Domain name is the name of your online business. That is how the customers will find, remember and know your company. It is as important as giving the name to your child. Hosting is the place where your business is located on the web. When you choose the hosting company imagine that you are looking for a real business center for your office. I bet you would like to have the office in downtown in some nice place. This will provide positive working environment for you and your potential customers. The same about the hosting provider and hosting plan: it should be reliable and user-friendly. Most of the big hosting companies (SiteGround, WP Engine, BlueHost, etc.) that use Softaculous in their Control Panels provide you with an easy-installation for WordPress CMS. If there is no such option on your server you will have to install it manually, which is pretty easy as well. Moreover, there are lots of articles and video tutorials about WordPress Engine Installation, and here is one of them. Now we have WordPress ready for the theme installation. 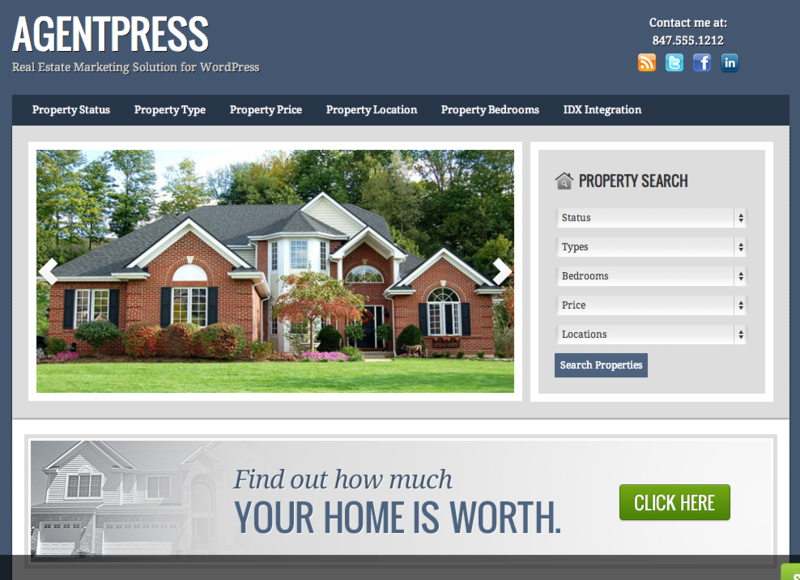 ThemeRex provides several powerful, nice-looking and quite popular solutions for real-estate business. Well, actually, why ThemeRex? Now look, when you need something done right, your first step is to do a research, right? That’s how most of our micro-niche templates are created. No matter what business niche (whether it is for Real Estate or for Yoga Center) it should match, a serious research makes the difference. Simply put, we analyze top niche websites, and what’s even more important we communicate with the real business owners of the branch from different countries. The main idea is to discover the design practices they prefer to adhere, change or add. And the results are, to put it mildly, impressive. Why we do that? First of all, because we want to make the product that 100% satisfies the customer’s needs. Secondly, our average number of sales per theme on Envato is around 1000. We do not want to disappoint 1000 businessmen around the globe! Especially if it is a Weapon Store or a Martial Club. Just kidding :). Let’s get back to the theme installation. 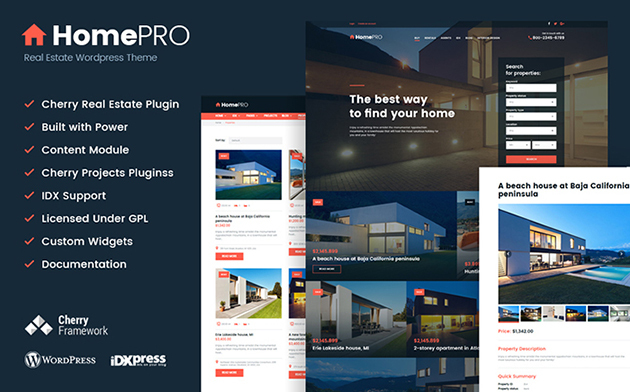 We will use my favorite one WordPress theme – Good Homes. Later it will be clear why it is my favorite. Let’s quickly go through theme installation process. Save and unpack the files from the archive. Now go to WordPress admin panel: /wp-admin: Appearance > Themes and click on the Add New button. Choose Upload theme option. Click on Browse…(or Choose file in Safari/Chrome), select the “good-homes.zip” and click Install Now button. After the successful installation, click on Activate or navigate to the Appearance > Themes and click the Activate button. Once the theme is activated, you will need to install the required ThemeREX Addons and other recommended plugins. Easy so far? Yes, there is nothing to be afraid of. WordPress is good for both: computer geeks and for normal human beings. Now let’s import the demo content to make our website look like on demo. Navigate to Appearance > Install Demo Data. You will get a window that asks you what exactly you want to import. I recommend you to import everything. You can always turn off the posts or pages that you do not need later. 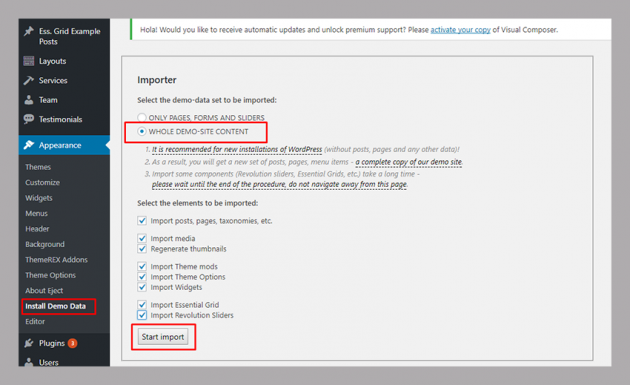 Press Start Import and in a minute – here you go – the demo content is on your website. Was it easy? Absolutely! I spent much more time writing these paragraphs than installing the theme. Now all we need is to Customize the look of our website and add our company details. So I will start with the basic settings. This can be done by pressing “Customize” button at the top of the screen and choose Menu – Main Menu. I just delete those items that I do not need. Save, return and do the same with Footer menu. Now it is time to edit the Header. In this tab you can edit your: logo, favicon, add header video or image, choose the header style and position, add your contact details, top bar message and working hours. Now is probably the most important stage for a Real Estate Agency. By pressing + NEW on the top bar we can add our: properties, team members, agents and posts. All we have to do after this is to remove the blocks, pages and posts that we do not need and add our info. The theme supports outstanding Visual Composer and Revolution Slider. With these powerful tools no coding or programming skills are required to manage your website. Just open the page you want to modify, press Edit with Visual Composer or Slider Revolution and enjoy managing your site content like a PRO. And secondly, it goes with AI SEO Restb.ai Plugin to resolve very important but sometimes quite annoying SEO problem. It automatically recognizes the image that you add to your Property or Gallery and automatically adds: Title, Caption, Alt Text and Description based on what is displayed on the image. The results are very accurate! This is extremely important for those who import numerous images. In order to have a good SEO for your website you have to fill in these fields all the time for each image. The average amount of images per 1 property is about 10. Average amount of properties on 1 site is about 40. You have to fill in 4 fields. So it is: 40 x 10 x 4 = 1,600 fields! That is plenty of time. And we did not take into account that you constantly add the new flats and remove the sold ones! So this plugin is going to save your time and increase SEO of the website. And, as I promised, here is a video to prove that anyone can make a real estate website in less than 20 minutes.